LISBON, Portugal — UNFPA’s Goodwill Ambassador in Portugal, Catarina Furtado, delivered an unprecedented €253,000 (more than $340,000) contribution to UNFPA through its Executive Director, Thoraya Ahmed Obaid, at a ceremony attended by Portugal’s Secretary of State for Foreign Affairs and Cooperation and two dozen journalists on 16 May. The donation is the largest ever received by UNFPA from Portugal. UNFPA Executive Director welcomes a cheque from Catarina Furtado in the company of João Gomes Cravinho, Portugal’s Secretary of State for Foreign Affairs and Cooperation. The funds were raised during a 12-hour televised dance marathon hosted last December year by Ms. Furtado, one of Portugal’s best-known actresses and television personalities. The funds raised during the telethon will be spent on a single project in a Lusophone country, to be selected jointly by UNFPA, Ms. Furtado and the Secretary of State. 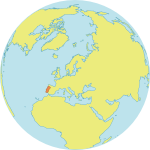 Portugal’s foreign assistance focuses on Lusophone countries – Angola, Cape Verde, Guinea Bissau, Mozambique and São Tomé & Principe in Africa, and Timor-Leste in Asia. Ms. Obaid’s two-day visit to Portugal included meetings with several parliamentary commissions and groups, government commissioners, and a wide range of non-governmental groups working on reproductive health, human rights, HIV/AIDS and women.